Cynosure’s ICON Aesthetic System is a versatile platform that can effectively deliver intense pulsed light (IPL) treatment to discoloured and damaged skin cells, safely getting rid of frustrating sun spots and other pigmentation issues. This service is exclusively offered at our Rockland location, but consultations are available at our Orleans location to determine if you’re an ideal candidate for treatment. The ICON system takes a similar approach to our Limelight Photofacials, using intense pulsed light to deliver stunning results. Spots and redness are a thing of the past with IPL treatments, and the Icon system offers leading flexibility that can address everything from skin damage to hair removal. By delivering pulses of intense light directly into the lower layers of skin. This light is converted to heat energy, which is in turn absorbed by target skin cells with colour (chromophores). This heat energy damages these cells, causing them to break down, whereupon they’re eventually filtered out through the body’s natural healing processes. This same heating action allows the Icon system to effectively target hair follicles for hair removal. The skin is left largely untouched by this process, which means a faster healing and recovery process! Patients with redder complexions, rosacea, flushing, and sunspots often benefit enormously from IPL treatments. Mixing the best of ICON’s IPL and 1540XD treatment options, the ThreeForMe laser treatment is a proven means of addressing all your skin concerns in one convenient service! Wrinkles, sun damage, and facial veins—all signs of aging skin—can be quickly addressed in a convenient 30-minute treatment. Starting with a first pass using IPL technology, your skin is treated to address discolouration, sun damage, and facial veins. Next, using ICON’s 1540XD applicator, we treat your skin with “microbeam” laser technology. This gently renews your skin for a younger, smoother-looking appearance. By stimulating new collagen and elastin production, we improve your skin’s structure to help reduce the telltale signs and symptoms of aging. 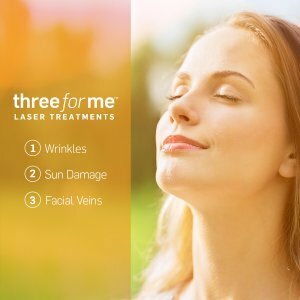 Am I a good candidate for IPL treatments? If you’re frustrated with rosacea, flushing, skin redness, uneven complexion, or other issues, you’re likely a good candidate for IPL treatment. Does my skin tone prevent me from getting IPL treatment? As with every treatment at SKINS Derma Care, we start with an initial consultation to determine if a given procedure will help you get the results you’re after. Darker complexions and tanned skin tones are not recommended for this treatment, but we may be able to recommend other options to help you get the results you’re after. Depending on the individual, each pulse could feel like a mild pinch or sting, though we use creams with numbing agents to help soothe the skin ahead of treatment, alongside a cooling gel. Pain is minimal, but you may experience some very mild discomfort. You’ll typically notice results after one or two treatment sessions, usually in the form of more even skin tone and a smoother look and fell. At this point, any sunspots will also begin to fade away. As treatment progresses, fine lines and wrinkles will also soften. Some patients experience minimal discomfort, but these are most often addressed using a topical numbing cream or cooling pack. You may experience minor swelling and redness following treatment. How long will it take for me to see results after ThreeForMe?